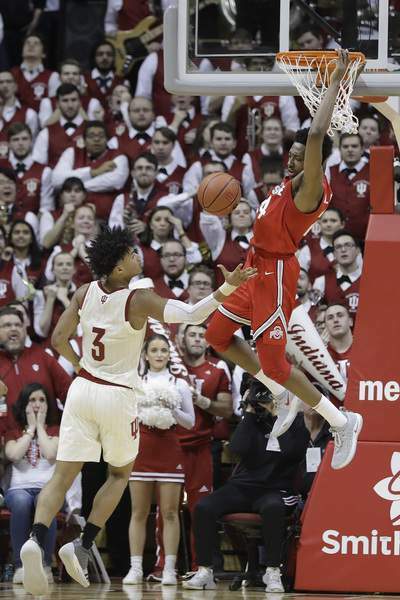 Associated Press Ohio State's Andre Wesson dunks in front of Indiana's Justin Smith on Sunday. The dunk gave Ohio State the lead for good with 20 seconds left. BLOOMINGTON – Romeo Langford was almost a hero. The Big Ten's top freshman scorer had the ball in his hands with 12 seconds left and Indiana trailing Ohio State by two. He wriggled free on the right wing and launched 3-pointer, holding his follow-through expectantly. The ball rimmed around and out. Ohio State rebounded. The Hoosiers lost. It was that kind of day Sunday for Indiana, which missed 12 of its first 14 3-point attempts and shot 40 percent from the field. Langford scored 15 points, but Andre Wesson had 15 for the Buckeyes, including a go-ahead dunk with 20 seconds left, and Ohio State won 55-52 in front of an announced crowd of 17,222 at Assembly Hall. The loss was the ninth in 10 games for the Hoosiers (13-11, 4-9 Big Ten). Indiana has lost four in a row at home for the first time since the 2010-11 season. They started 10-0 at Assembly Hall this season. The game was a slog from the beginning, with neither team in a rhythm most of the afternoon offensively. The Hoosiers fell behind 11-2 within the first five minutes before rallying to within 23-21 at halftime. Ohio State (16-7, 6-6) responded with an 11-2 run early in the second half to go in front 34-25. Indiana's offense struggled most of the game as the Buckeyes packed the lane and dared the Hoosiers to beat them from beyond the arc. For 34 minutes, the Hoosiers threw up brick after brick and Ohio State remained ahead. “Our team in general during the game needed to make some perimeter shots the way that they were playing,” coach Archie Miller said. “You just needed to make a few. If you don't make a few, obviously the game is going to kind of look like that. With time running out, Indiana finally started hitting some shots from deep and the whole game changed within minutes. Trailing 47-38, the Hoosiers scored nine points in a row on three 3-pointers, including two from Langford. After his second 3, which tied the game with 4:54 left, the New Albany native remained in place for an extra second after the shot went in, staring directly at his bench. Indiana had a chance to go in front with 40 seconds left, but a pass was deflected, and the Hoosiers turned the ball over. They then called two timeouts before the ball was inbounded. Ohio State went in front for good when Wesson slipped a screen and dived to the basket for a dunk with 20 seconds left. It was a beautifully designed play out of a timeout from Buckeyes coach Chris Holtmann and it won the game when Langford's final 3 rimmed out. Notes: Blackhawk Christian center Caleb Furst, a five-star recruit in the class of 2021, attended the game with his family. ... Indiana wore specialty uniforms celebrating Black History Month and the 70th anniversary of Hoosiers center Bill Garrett becoming the first African-American basketball player in the Big Ten to start a game.